Flags fly out in the fields of the main stages. Today is the first Sunday in May, which means it’s the last day of the New Orleans Jazz and Heritage Festival. This seven-day art, food, culture and music event is held the last weekend in April and first weekend in May. The second weekend, which kicks off on a Thursday, happens to conflict with the running of the Kentucky Derby, but since Churchill Downs owns Fair Grounds Race Course where Jazz Fest is held, there’s a little nod to the Run for the Roses, as all the beer cups sport Churchill’s Twin Spires emblem and the race is on in the grandstand. It’s amusing to those of us from the Bluegrass, but Derby isn’t hardly a consideration to the over 450,000 that annually attend Jazz Fest. In a tradition similar to picking ponies on Derby day, my Jazz Fest mornings consist of waking up bleary eyed, sipping on a Bloody Mary and going over the grid-boxed schedule of the coming day’s performers. I highlight all the shows I want to try and catch, that way when the intoxication sets in I can refer to my schedule and the markings will help refresh my addled memory. There is a reason artists and fans return to this event year after year. Once you get around Fest the rest of the world disappears. Nobody gets bent out of shape about where they sit, there are no fights, no one is dying (at least not on site), and this is a music-savvy crowd that appreciates those who can play well. I find a lot of people have heard of Jazz Fest, but are less clear of its true scope. I was guilty of this myself until moving to New Orleans and attending for the first time. Yes there are several other jazz festivals of note held around the world, but there is only one “Jazz Fest.” And no this is not just about jazz music. There is blues, R&B, gospel, Cajun, zydeco, Afro-Caribbean, folk, Latin, rock, rap, country, bluegrass, electronica, roots, and indie – you name it and it’s represented at Fest. There are two main stages, the Gentilly at turn two, and Acura at turn four on the track, which draw monster crowds simultaneously to help thin the herd, then eight specialty stages cater to specific genres like jazz, blues, gospel, and other disciplines. 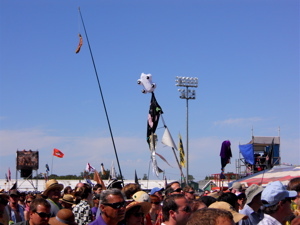 National acts and those able to transcend their disciplines get bumped to the main stages or to the Congo Square stage. The crowds are usually slightly thinner because you would have to travel on a Wednesday and miss more work to make it into town for the Thursday session. The food lines are shorter and navigating the infield is less congested, all making it more accommodating for locals to come in and get a taste before the crush hits. You have to remember that a lot of these local artists, even the famous ones, have been gigging around town for decades. Locals have grown up attending events where the Rebirth Brass Band, Dirty Dozen, Kermit Ruffins, Dr. John, the Radiators, Neville Brothers, Irma Thomas, The Meters, and Walter “Wolfman” Washington play. They’re not necessarily interested in fighting crowds in order to catch a glimpse of them. Once Jazz Fest is over and things calm back down, many of these cats can be seen in a small bar or theater, up close and personal without all the fuss, so Locals Day at the Jazz Fest is a great day to ease into the festival and mix with real New Orleans residents. The longtime producer and organizer of Jazz Fest, Quint Davis, announces the musical acts in mid-January to a packed hotel ballroom. Who is playing which weekend determines tens of thousands of travel plans, as out-of-towners more often choose one weekend to attend, then switch out with a whole other set of visitors. Once the first weekend concludes there remains a ton of good music being played around town. Many artists scheduled for the second weekend arrive before the festival starts, so it’s a great opportunity to see notable musicians making guest appearances at small bars. You can try doing both weekends, and many people coming from Europe and Australia stay for both since they’ve traveled from far and wide, but having persistently done the double dip I must recommend it with trepidation. That’s a brutal 12 days to go without sleep. Even at a young age it will take your body some time to recover, so plan with caution, and choose your substances wisely. In reality, it doesn’t matter who is playing. This is all about a vibe that comes from the heritage of the music on display, the culture, location, all of which transcend who is actually playing. Coachella does its thing in the California desert with a beautiful setting and lots of pretty Hollywood folk; Bonnaroo allows attendees to sleep on site in Manchester, Tenn., and has the best drugs; and Lollapalooza has that urban appeal of being in the heart of Chicago. All of these are strong profiles, but they are surface deep on culture at best, serve a narrow demographic and are completely artist driven. Jazz Fest brings together age ranges from children (there’s a Kid’s Tent), to college students, 30-somethings, and 80-somethings. Everybody gathers at the Fair Grounds to shake their tail feathers and bow to the majesty of these true musicians, many of whom are master craftsmen that have never received great monetary reward from their prowess, but play because music is in their soul. 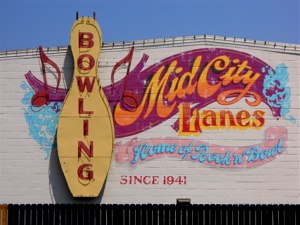 The racetrack is located in the middle of a residential area in Mid-City. There really is no event parking available, so for those attending they come via cab, bike, walk, or take the streetcar up to the New Orleans Museum of Art and walk down. 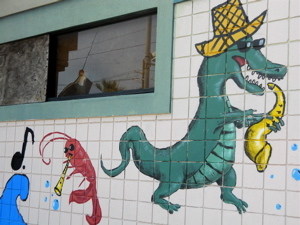 There are a couple bars located within a block or two of the entrances: The Seahorse Saloon (1648 Gentilly Blvd. 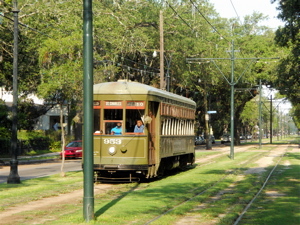 ), or Liuzza’s By The Track (1518 N. Lopez) if coming from Esplanade Avenue. Both do a brisk business of chilled shots and Bloody Marys to-go. Who doesn’t like breakfast drinks?!? It’s best to get your hops levels right before entering the grounds where drink prices are elevated. Either place works, but Liuzza’s offers its famous BBQ Shrimp Po-Boy. That’s a must-eat at least once a weekend. With to-go cups in hand, the crowd shuffles through this tangled web of streets towards the entrances. All the houses are decorated, folks are grilling in their yards and selling beer and eats to the masses. Stereos are blasting WWOZ, the local radio station that broadcasts from the Fair Grounds, and brass bands are playing in the streets. There are a couple groceries along the way too, like Terranova’s (3308 Esplanade Ave.), where folks can purchase liters of water, aspirin and sun tan lotion – all those last minute essentials. 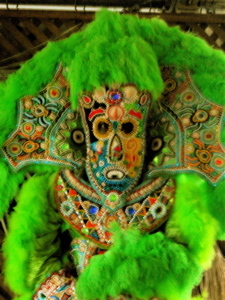 A Mardi Gras Indian costume. I usually pick up water, and a half pint of Taaka vodka. It’s not the best stuff, but it cracks me up that the label is owned by Sazerac of New Orleans, yet brewed in Frankfort, Ky., my hometown, by Buffalo Trace Distillery – another nice mixture of Bluegrass and Nola traditions. Once inside it’s a kaleidoscope of music and culture. The sounds from one stage grow and fade as the music from another approaches. Parades of colorful Mardi Gras Indians mix with festive second-liners, as they pump their parasols draped with fringe into the air and step to the beat. Gospel greets me when I come through the Sauvage pedestrian entrance. It’s not exactly my thing, but when you roll past that tent and catch part of a riff that sounds familiar, and it registers that this huge congregation of African-American vocalists are belting out “Smells Like Teenage Spirit,” by Nirvana – it will freeze you in your tracks and blow your hair back. I haven’t been here five minutes and already I’ve experienced something I never would have otherwise. This is a circumstance that repeats itself often over the two weekends. I routinely fly by and check out 10 or 15 minutes of some random set that grabs my attention, then go on about my way. Something to keep in mind about Jazz Fest is it’s a celebration of music, and this event tends to be the great equalizer. There are no exorbitant light shows or pyrotechnics to hide behind. Every artist, no matter of size or success, must perform on the same stages and through the same sound system. It’s a “warts and all” kind of situation. This is a big outside venue with lots of extraneous distortion from the crowd and other stages, and there’s no roof, so noise bleeds away. As an artist you gotta bring it live, because if someone lacks the basic talent to sing under these conditions it’s quite obvious and painful. That happens from time to time. Many people never even drop by either of the main stages. They will set up a chair at Congo Square or take a bleacher seat inside the Blues Tent, and stay there the whole day. Others will risk their safety and run to the front of the Acura or Gentilly Stages and set up shop, content to see whoever walks out to play. I prefer to stage hop. 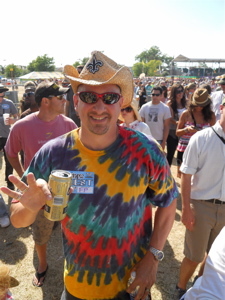 I get ADD at music festivals, and Jazz Fest is only too happy to accommodate my need to try and see some of everything. The dirt track serves as a transportation mechanism. If you are going for food or to another smaller stage, there are pathways within the in-field to travel upon, but if I’m at Acura or the Blues Tent and need to reach the Gentilly Stage I hop on the outside track and motor around the curve. The humorous thing is there are oodles of other people all huffing in every direction doing the same thing. We’re all seeking beer tents with smaller lines, trying to grab some food, or hit a port-o-potty on the run to make that next show. Just like racecars, we’re coming in for service and need gas and tires. I’ll mention that I eat and drink strategically. Jazz Fest is not a cheap endeavor, so I do what I can to conserve – it’s at night when I need my cash. I’m here to see a ridiculous amount of music, and don’t want to be hindered. Standing in line pisses me off, so I minimize delays. The Llama at the Gentilly Stage for Galactic. I eat early at Fest or on the way in, and maybe again on the way out. Beer lines are long and necessitate bathroom breaks (though if you do need to go I recommend the grandstand, where there is indoor plumbing). If you’re smack in the middle of a main stage set with 50,000 people surrounding you, there is no leaving to hit the head, so drink liquor instead or partake in other. They sell plenty of beer by the case, and will toss in ice to keep it chilled. Potent Southern Comfort daiquiris are available, or my usual move is to sample the excellent strawberry lemonade or rosemint herbal iced tea sold on-site (much shorter lines for these), and then spike it with the vodka I snuck inside. Taaka isn’t something to drink straight, but it mixes well. The food is amazing. I always start my Jazz Fest off with a bowl of Pheasant, Quail & Andouille Gumbo, from Prejean’s. It will change your life. Dark, thick, and substantial – it’s a lifeblood and will lubricate a body to keep it going. The Cajun Duck Po-Boy, Crawfish Beignets, Cochon de Lait Po-Boy, Fried Soft-Shell Crab Po-Boy and Crawfish Bread are all decadently wonderful too. The servings are mostly tapas sized, sufficient for a big snack or meal, and cost under $5. The sandwiches or fried chicken are bigger meals. The numerous offerings are meant for attendees to sample and share. On busy days the lines can be long but you can score some hefty portions on the cheap after the last band has played and purveyors want to get rid of what remains – especially the Cajun Jambalaya and Crawfish Monica. The art is complex but accessible. Congo Square has more knicknack items, whereas Contemporary Crafts hosts some of the best festival artists in the country and is not cheap. Many of these artists only prepare for Jazz Fest and can make enough in sales over one weekend to not have to work the rest of the year. The artists rotate from one weekend to the next. Overall this is one big party and it rolls citywide. Keep in mind, seeing a show in New Orleans, especially out at the Fair Grounds, isn’t like seeing music anywhere else. This is where popular music began in America. New Orleans is hallowed ground, and the music takes on a life of its own when played outdoors. There will be people crying, shouting, praising the Lord and having religious experiences. The other component I would be remiss in not mentioning is the nightlife. That is what really grabbed me about how this festival is set up and run. All the other major music festivals run late and try to keep people on site spending money. Well New Orleans has too much to offer to make that an effective business plan. It becomes grueling to party 12-14 hours out in the elements, and then try to hit aftershows, because it all starts again the next day by 11 AM. 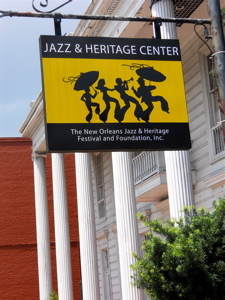 Jazz Fest runs from 11-7 daily. I can be home or in my hotel by 8 PM. I recommend drinking some water, because “hydration” is important, get a shower, and meet up with friends for a big dinner out at one of the fine New Orleans restaurants, of which there are more than 1,300 in the New Orleans metro area! There are plenty of folks who use Jazz Fest as an excuse to come eat New Orleans-based Creole and Cajun fare. During dinner I get my alcohol intake back up to speed and by 11:00 PM it’s time to hit Frenchman Street, Tipitna’s, The Howlin’ Wolf, the Maple Leaf, Rock-n-Bowl, wherever. There are quality shows by all the folks playing at Fest, plus major national talent that comes in nightly to play special engagements. You gotta keep your eyes and ears open, because some big bands will fly by using an alias so they can play a small club and not get totally overrun. I find usually one weekend the Fest has better talent and the other weekend the best music can be found in the clubs. If you’re going to both it doesn’t matter. The only thing to worry about is sleep. I end up going 72-hours sometimes without rest. I’ve never seen a level or quality of shows that tips like in New Orleans – for 12 straight days. There are the mainline gigs by guys like B.B. King, Buddy Guy or Dr. John, that will kick at the House of Blues around 9ish. Those will get out and bleed over into the club shows at 11 PM with Anders Osborne, Trombone Shorty, Gov’t Mule, Dumpstaphunk and the Funky Meters. Then a whole other set of shows will start jumping around 2 or 3 AM. That’s when the magic happens, because all the musicians from the high-ticket performances are loose, and they start dropping by the clubs. You’ll get Dave Matthews, Ivan Neville, Karl Denson, Warren Haynes, Derek Trucks, George Porter, Jr., Robert Randolph, Luther Dickinson…, coming by to jam with friends till daybreak. 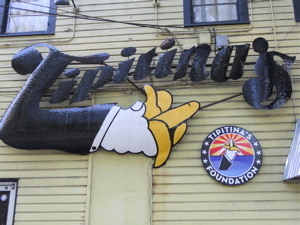 My biggest recommendation these days is to go see Galactic, particularly at Tipitina’s. That show will change your life. There’s horns, funk, rap, and Stanton Moore is sick on drums. It will go into the early morning hours and be a sweaty mess. You will meet 10 new people, probably get a date, and hatch some revolutionary idea in haze of booze and drugs that will perhaps alter the course of humanity. That’s not bad for one night. When the lights come back up the next day and those drunken horns start ringin’ in the air. It’s like musical intoxication coming from all directions swirling around in my brain. This entry was posted in Events, Food, Music, Reviews, Travel and tagged Jazz Fest, New Orleans, Quint Davis. Bookmark the permalink.